We are pleased to present our first concert of 2019, La Sonnambula! We will be performing the Grad Duetto Concertato from Bellini's opera, La Sonnambula (the Sleepwaker) performed by two members of one of America's premier ensembles, the United States Coast Guard Band. We will also be performing other favorites such as Romanian Rhapsody No. 2 by Georges Enesco, Solid Men to the Front by John Philip Sousa, Concert Variations by Claude T. Smith, Symphony No. 6 (Mvt III) by James Barnes, and Cousins by Herbert L. Clarke. The concert will take place at the Harlan High School auditorium and starts at 6:00 PM and is free and open to the public. This season, the San Antonio Wind Symphony will present music with ties to the culture of San Antonio, celebrating our city's 300th Anniversary! This concert will be the San Antonio Wind Symphony's Annual Christmas Concert! The San Antonio Wind Symphony will present a concert of music with ties to the culture of San Antonio, celebrating our city's 300th Anniversary! San Antonio is Military City USA because of the number of military families and civilians working in service to the nation! This year we are honoring 100 Years since the end of WWI, and the sacrifice of our Soldiers in service to the United States. We will be performing works by John Williams' Hymn to the Fallen; Ready for the Call by Sean Nelson; former UTSA Music Professor James Balentines' arrangement of America the Beautiful; the thrilling Victory at Sea by Robert Russell Bennett; Samuel Barber's legendary Commando March; Esprit de Corps by Robert Jager, and more! The Veteran's Day concert will take place on Sunday, November 11 at 6 PM in the John Marshall High School Auditorium. Entrance and parking are free! We hope you can join us in honoring the sacrifices of our Veterans and their families! The San Antonio Wind Symphony will present a lecture and concert of music with ties to the culture of San Antonio, celebrating our city's 300th Anniversary! This concert will be the opening concert of our 16th Season supporting music education in San Antonio and the surrounding area! Location and other details to be determined. SAN ANTONIO WIND SYMPHONY: A Night At The Movies! The San Antonio Wind Symphony is proud to present our last concert of the season, A Night At The Movies! SAN ANTONIO WIND SYMPHONY: IN CONCERT WITH THE SAN ANTONIO MASTERSINGERS! This season, the San Antonio Wind Symphony will present music with ties to the diverse culture of San Antonio, and celebrating our city's 300th Anniversary! We are very pleased to announce our next concert will be a collaborative endeavor with the San Antonio Mastersingers, directed by Dr. John Silantien, to be held in the sanctuary at Trinity Baptist Church on 319 E. Mulberry Avenue on April 8 at 3:00 PM. 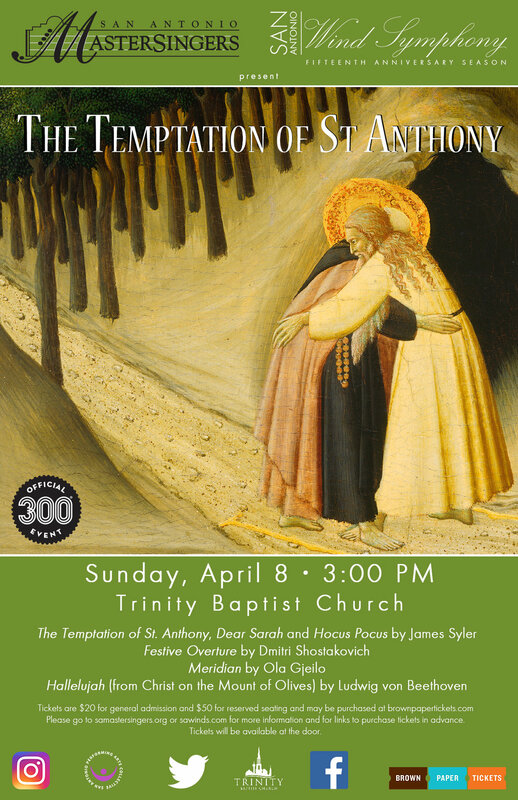 We will be featuring three works by acclaimed composer, James Syler, The Temptation of St Anthony (For Wind Symphony and Chorus), Dear Sarah (for Chorus) and Hocus Pocus (for Wind Symphony). Mr. Syler received a Bachelor of Music degree from Northern Illinois University in 1983 and a Master of Music degree from the University of Miami in 1988. In 1991 he continued his studies at the University of Texas at Austin. He has studied privately with composers Alfred Reed, Karl Korte and Pulitzer prizewinner Michael Colgrass. Awards include a 2002 commission from the American Composers Forum in New York to compose String Quartet No. 1 for the Artaria String Quartet of St. Paul, MN; the 1993 National Band Association Composition Award; two grants from the American Music Center in New York; the 1993 Arnald Gabriel Composition Award; and more than 20 commissions to date. Mr. Syler has been on the adjunct faculty at the University of Texas at San Antonio since 2001 and teaches private composition lessons and Orchestration. Mr. Syler also teaches composition at the University of the Incarnate Word and is on the music faculty of San Antonio College. Other works to be performed include, Festive Overture for Wind Symphony, by Dmitri Shostakovich; Meridian by Ola Gjeilo for Chorus and Wind Symphony, and Hallelujah (from Christ on the Mount of Olives) by Ludwing von Beethoven. Please visit sawinds.com or samastersingers.org for more information and links to purchase tickets. Tickets will be available at the door, and there is plenty of free parking! Please join us for our fourth concert of the season as we present Concetino da Camera by Jacques Ibert, performed by acclaimed UTSA Saxophone Professor, Dr. Rami Abdulrazzak El-Farrah. "Concertino Da Camera, written in 1935 by Jacques Ibert (1890-1962) was a small concerto for alto-saxophone and eleven instruments: Flute, Bassoon, Oboe, Horn, Trumpet and Strings. This Concertino is in two movements, Allegro con moto and Larghetto – Animato Molto, is dedicated to the Saxophonist Sigurd Rascher and is well known for its use of the Alto-Saxophone. It can be technically challenging and has a strong lyrical part. Its author, Jacques Ibert (1890-1962) is a neoclassical composer who won the Prix de Rome in 1919. He composed many symphonic suites, operas and seven orchestras, including Angelique (1926) and Divertissement (1930). He was also in charge of the Accadémie de France in the Villa Médicis (Roma) and was later administrator for the Paris Opera. This concerto has some similarities with his Flute Concerto (1934)"
We will also be performing include Dmitri Shostakovich's masterpiece, Festive Overture; Percy Aldridge Grainger's Lincolnshire Posy (1. Lisbon [Sailor's Song] and 2. Horkstow Grange [The Miser and the Man]}; Frank Ticheli's beautiful Earth Song; Professor Alfredo Sturchio's march, Viva Savoia! ; Randall Standridge's Tanchōzuru, Jamie Texidor's legendary paso doble, Amparita Roca, and Elliot del Borgo's Two British Folk Songs. The concert will be in Titan Theatre at Southwest Legacy High School and is free and open to the public, we hope to see you there! This concert will be the San Antonio Wind Symphony's Annual Christmas Concert. This lecture by Dr. Robert Rustowicz, and accomanying concert will focus on the rarely performed piece by Florent Schmidt, Dionysiaques. The San Antonio Wind Symphony is proud to present the first concert of our fifteenth season at St. John's Lutheran Church! To honor the 300th Anniversary of San Antonio, we will be performing international works influencing the musical traditions of San Antonio to include Franz von Suppé's classic Light Cavalry Overture; Gordon Jacobs's Music for a Festival featuring four Student Musicians from the UTSA Department of Music; Sergei Prokofiev's March, Op. 99, which was originally composed for military band; Ernest Williams' famous Three Bluejackets for three solo cornetists, San Antonio Symphony Second Trumpet, Lauren Eberhart, San Antonio College Professor, Andrew Gignac and retired San Antonio Symphony Assistant Principal/Third Trumpet and UTSA Professor, Jan Roller. We will finish this concert with W.C. Handy's legendary march, The St. Louis Blues. The concert is open to the public free of charge, and we hope you will be able to attend. Our next concert is Sunday, November 12th at 6:00 PM in the UTSA Recital Hall. The San Antonio Wind Symphony will present its fifth concert of the season, on Sunday evening, April 23rd, in the James Madison High School Theater for the Performing Arts at 6:00 p.m. In keeping with its educational outreach program, the Wind Symphony will will draw from works on the U.I.L. Prescribed Music List, many of which receive very little attention. The works from the U.I.L. Prescribed Music List that we will be performing include Hector Berlioz's The Overture to Beatrice and Benedict, Frank Ticheli's aggressive and rhythmically active dance (representing the final days of the doomed city of Pompeii), Vesuvius, Norman Dello Joio's Satiric Dances (for A Comedy by Aristophanes), John Gibson's contemplative tone poem, Resting in the Peace of His Hands, Charles Ives' Variations on America, and Charles Griffes' masterpiece, The White Peacock. Although not on the Prescribed Music List, We will be performing the John Philip Sousa march, Easter Monday on the White House Lawn and Vaclav Nelhybel's first work for band, Chorale. Our next concert is Sunday, May 21st at 6:00 PM in the UTSA Recital Hall. Please join us for our fourth concert of the season as we present the First Movement of the Fourth Clarinet Concerto by Louis Spohr. This year's artist in residence will be offering master classes and clinics at many area middle schools, high schools and at UTSA. Schedule will be released soon. "At the close of 1821 Spohr’s career reached a major turning point with his appointment as Kapellmeister at the court of Kassel and he remained there for the rest of his life. It was in Kassel that he composed the Clarinet Concerto No 4 in E minor WoO20, sketched in August 1828 and orchestrated in January 1829. It ranks among Spohr’s finest compositions and received its premiere in Hermstedt’s hands on 12 June 1829 during the Nordhausen Musical Festival where the composer demonstrated his continuing love for Mozart by taking the viola part in a performance of the latter’s Clarinet Trio, K498. The fourth concerto, the only one Spohr composed for the A clarinet, opens with a sombre Romantic-sounding theme (Allegro vivace) which is contrasted with a more serene second subject, but this relaxed atmosphere is interrupted by powerful though brief orchestral outbursts. The Larghetto is reflective and melancholy, with operatic touches coming from declamatory passages and dramatic arpeggios. The concert will be at the Southwest High School Auditorium and is free and open to the public, we hope to see you there! On Sunday evening, December 11th, at 6:00 pm, the San Antonio Wind Symphony will present its annual Christmas concert, Fanfare for Christmas in the Lady Bird Johnson High School Auditorium. Because the Tosca concert is on a school night, we have been approved for free parking in LOT #1 (south campus, to the east/right of the walkway up the hill). Guests may park in any unmarked, Faculty A or Faculty B slot, but will be ticketed if they park in the metered parking (unless they pay) or 24-hour Reserved slot (first 3 rows or so). On Monday evening, November 7th, at 7:30 pm, the San Antonio Wind Symphony will present its second concert of the Fall, "Tosca Act II, a Lecture and Concert" in the Department of Music Recital Hall on the main UTSA campus. The performance will feature a single work in the form of a lecture recital. In 1904, Professor Alfredo Sturchio, grandfather of recognized San Antonio musician/educator/businessman Alfred Sturchio and friend of Giacomo Puccini, transcribed the Third Act of Puccini's opera TOSCA for a wind band in Naples, Italy. The manuscript score has been passed down to Alfred and was found amongst a sizeable band library acquired by Alfred's father over the years and donated to the UTSA Instrumental Music Library. The manuscript has been revised for modern band by Robert Rustowicz and will be the basis for the concert. The evening's performance will include a verbal presentation of a wealth of information regarding the Sturchio family, the manuscript score and parts, and a display of memorabilia in support of the presentation. Seating begins at 7:00 PM. Please note the time change for this Sunday's concert, 6:30 PM!! Please join the San Antonio Wind Symphony for our fourteenth season opening concert, The Big Country! This concert will be a joint concert with the Helotes Area Community Band, celebrating music remindful of big skies and open plains. The Helotes Area Community Band, conducted by Mr. Charles Kuentz, will be performing "Exultation" by Philip Sparke, "American Patrol 2" by F.W. Meacham, "Thoughts of Love" by Arthur Pryor, "Marriage of Figaro" by W.A. Mozart, and "The Light Eternal" by James Swearingen!! Then, the San Antonio Wind Symphony, under the direction of Dr. Robert Rustowicz, will be performing "The Main Theme from The Big Country" by Jerome Moross, "Beguine for Band" by Glenn Osser, "Lezghinka" by Aram Khatchaturian, "Polonaise" from Rusalka" by Antonín Leopold Dvorák and the "Finale to Symphony in Bb" by Paul Fauchet. Then both ensembles will join talents to perform "Amparita Roca" by Jamie Texidor, to be conducted by legendary Band Director, Mr. Charles Kuentz, Sr. The Concert is free and open to the public and will take place at the beautiful Thomas Jefferson High School Auditorium. The San Antonio Wind Symphony, under the direction of Dr. Robert Rustowicz, will make its first appearance in the Tobin Center for the Performing Arts on May 25th, 2016. The program reflects a wide variety of musical styles and genres, from orchestral transcriptions to original works for winds, from melodious and expressive to textural, from conventional to contemporary. The program also draws from a variety of nationalities - France, England, Hungary, Armenia, Mexico and the United States. The program will open with Hector Berlioz' Overture to the opera Benvenuto Cellini. Dr. Robert Hallquist, pianist, will be the featured soloist in Franz Liszt's Fantasy on Hungarian Folk Melodies. Eric Whitacre's Lux Aurumque ('Light and Gold'), originally choral composition, focuses on textural sounds. The Children's March of Percy Aldridge Grainger, an original work for band is a spirited work that introduces an infectious melody and then subjects it to a variety of treatments. The American Salute of Morton Gould draws from the lighter, more popular vein of American band music while the Danzón No. 2 of Arturo Márquez draws from folklore and dance in the Mexican state of Vera Cruz. The Symphonic Prelude of Mark Camphouse was inspired by a visit to the Cemetery at Colleville-Sur-Mer, France, that overlooks Omaha Beach and the English Channel. The program concludes with the Armenian Dances, Part I, by the popular and prolific American wind band composer, Alfred Reed. The San Antonio Wind Symphony will present its fifth concert of the season on Sunday evening, April 17th, in the auditorium at Smithson Valley High School. The concert will begin at 6:00 pm and is open to the public free of charge. The concert will open with Morton Gould's popular "American Salute", based on "When Johnny Comes Marching Home." Looking back to nineteenth century French opera, the Wind Symphony has programmed the "Overture to Benvenuto Cellini" by Hector Berlioz. A choral composer who currently enjoys great popularity, Eric Whitacre originally wrote "Lux Aurumque" ("Light and Gold") for vocal ensemble and transcribed it for winds himself. "Danzón No. 2" by Mexican composer Arturo Márquez reflects on the popular Danzón dance style, an important part of the folklore in the state of Veracruz. The "52nd Street Chorale" of Justin Freer draws on the rich jazz heritage (1920's to 1950's) of 52nd Street in Midtown Manhattan, New York City. The Wind Symphony will conclude the program with the "Armenian Dances, Part I" by the popular and prolific Ameriocancomposer Alfred Reed. The Wind Symphony's next performance is May 25th at the Tobin Center for the Performing Arts. 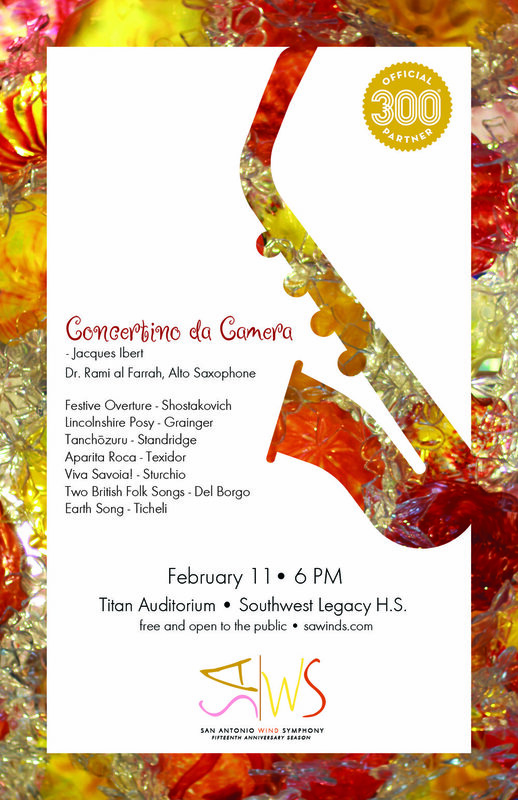 The San Antonio Wind Symphony will present "Watercolors", its first concert of the new year, on Sunday evening, February 21st, in the auditorium of Southwest High School at 6:00 p.m. In keeping with its educational outreach program, the Wind Symphony will perform music under consideration by the Southwest High School band program for their Spring performances. The works under consideration by the Southwest High School bands include Leonard Bernstein's Overture to Candide, Eric Whitacre's October, Frank Ticheli's Joy Revisited, Brian Balmages' Rippling Watercolors, Claude T. Smith's Concert Variations and Pavel Tschesnokoff's Salvation is Created. In addition, the Wind Symphony will add a work of its own - the Overture to Benvenuto Cellini by Hector Berlioz. According to Richard Flores, Director of Bands at Southwest High School, two of the bands - Wind Ensemble A and Wind Ensemble B - will perform in Carnegie Hall in New York City as part of a festival this coming March. Over 100 students will be involved in the trip. Please join us for our annual Christmas Concert, "A Christmas Celebration" at the UTSA Recital Hall. The concert will be at 6 PM and will be featuring a variety of classic Christmas Music selections! Entry is free and open to the public! Please join the San Antonio Wind Symphony for our thirteenth season opening concert, Britannia! This concert will be celebrating the music of the British Isles, and we will be performing pieces such as "Children's March" by Percy Aldridge Grainger, "Second Suite in F" by Gustav Holst, "William Byrd Suite" by Gordon Jacob, "Fantasia on a Theme by Thomas Tallis" by Ralph Vaughan Williams, "Prelude, Siciliano and Rondo" by Malcolm Arnold and more!! The Concert is free and open to the public and will take place at the Recital Hall at the UTSA Fine Arts Center. Catch the San Antonio Wind Symphony this upcoming Spring! Concert programs to be announced at a later date. The San Antonio Wind Symphony will present its fifth concert of the season on Sunday afternoon, April 26th, at 5:00 pm, in the auditorium at Stevens High School in the Northside Independent School District. The concert is open to the public free of charge. The program pays tribute to both the rich musical heritage found in San Antonio's Hispanic culture and the wonderful time of the year - Fiesta! Included on the concert will be Genaro Codina's patriotic Zacatecas March and Jose Pablo Moncayo's Huapango (dance music). One of two featured works, H. Owen Reed's La Fiesta Mexicana is the result of a Guggenheim Fellowship to study music in Mexico. The other is Aaron Copland's El Salon Mexico, a musical depiction of a dance hall in Mexico City and makes extensive use of Mexican folk music. The program is rounded off with two paso dobles - Pasqual Marquina's La Gitano del Albaicin and Terrig Tucci's Lola Flores. The Wind Symphony is grateful to Mr. Robert Rubio and Stevens High school for the gracious use of their wonderful auditorium. We hope to see you there! The repertoire selected for this program focuses on U.I.L. concert band repertoire and includes works scheduled by the Southwest High School bands, including Padilla's paso doble El Relicario , Tommy Fry's Triptych , Frank Tichel's Amazing Grace , and Rossini's overture La Cenerentola Sol . The program will also include music by John Barnes Chance - the Elegy , Variations on Korean Folk Song , and Incantation and Dance . The concert is open to the public free of charge. Southwest High School is located on FM-1604, just north of Old Pearsall Road (11914 Dragon Lane, San Antonio, TX 78252). A Celebration of Christmas Musical Traditions! Known primarily as an arranger and orchestrator of Broadway musicals, Robert Russell Bennett played an important role in the development of music for the wind band during the 1950's and 1960's, providing the repertoire with eleven original compositions and numerous concert arrangements of Broadway shows, including Porgy and Bess, The King and I, Carousel Waltzes, My Fair Lady, Gigi, Funny Girl and The Sound of Music. He was also involved, with Richard Rodgers in the soundtrack to the 191152-53 documentary television series Victory at Sea. The Wind Symphony's program will include the Suite of Old American Dances (1950) and the Symphonic Songs for Band (1958), the Four Preludes (1974) and Victory at Sea. The Suite of Old American Dances is a recollection of characteristic dances remembered from his childhood. The Symphonic Songs is a suite of three movements that are as much dance as song, possessing a remarkably light and entertaining quality. The Four Preludes are musical tribute to four composers with whom her closely associated - George Gershwin, Vincent Youmans, Cole Porter and Jerome Kern. The concert is open to the public free of charge in the Department of Music Recital Hall on the main campus of the University of Texas at San Antonio. The San Antonio Wind Symphony hits the big screens this summer as they conclude their 11th season of performances with "Music from the Movies"! The concert will be held in the UTSA Recital Hall.